What does a vulnerable community look like? It includes those who pay more than fifty per cent of their income for rent and utilities or those who spend thirty percent or more of their pay towards traveling to and from work. A significant portion of residents in the Coliseum area are both, according to a 2015 analysis called Stronger Housing, Safer Communities (ABAG/BCDC-ART). In comparison to other Bay Area communities, people in places like East Oakland’s Havenscourt, Woodland, and Eastmont also have smaller incomes, lower high school graduation rates, and other conditions that might make it harder for them to recover from a flood event, whether that requires finding a new home (or a new job they can commute to from a new home) or relocating extended families. Being “non-white” also makes these communities more susceptible to a natural disaster than predominantly white communities, according to the analysis. 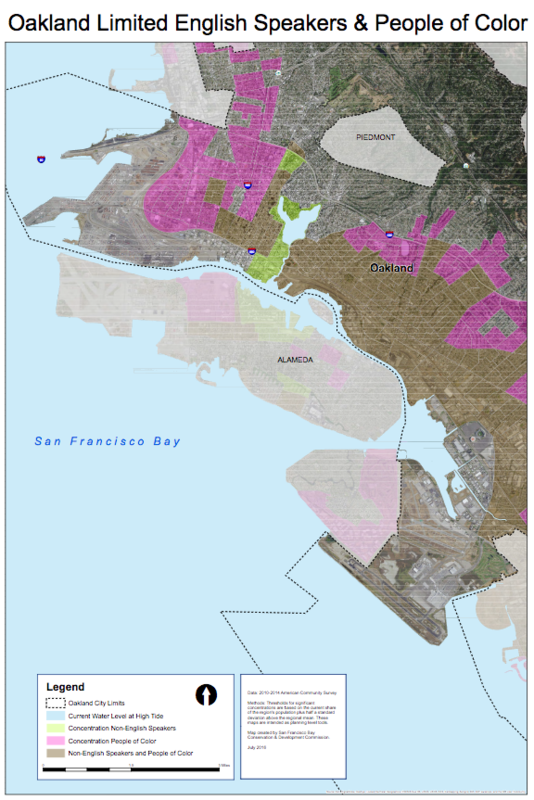 Overall, Coliseum-area neighborhoods qualify for seven of the ten vulnerability indicators identified by regional planning agencies, making these communities some of the highest-risk in the Bay Area for devastation after an earthquake or combined flood event (sea level rise plus storms and runoff plus high groundwater). Take a look at these five maps showing local vulnerabilities and see for yourself.